The 28th annual Folsom Street Fair was on September 25, 2011. This gallery’s widest image is 1500 pixels wide; its tallest image is 1500 pixels high. 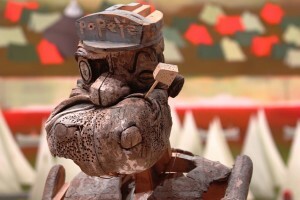 Sculpture: Kristen Morgin, Popeye, 2006. Background: Thomas Eggerer, Call of the Wind II, 2007. This year’s Up Your Alley Fair (AKA Dore Alley Fair) took place on 2010 July 25. On 2010 May 22, The Sisters of Perpetual Indulgence, Inc. held the “Tour de Castro”, a charity tricycle race benefiting AIDS/LifeCycle riders. I’m trying something new, here; all these images are 1080 pixels high. You may want to enlarge your browser window.